First published in The Peak September 2008. A new literary arts zine headed by SFU student editors, Hacksaw, has emerged to crudely break things apart so the architect can put the pieces together as something new and wonderful. At least that explains the magazines title and its messy cut-and-paste, DIY look. A look at the back cover will inform you that Hacksaw was indeed printed and assembled by hand. This first issue is said to blend contemporary youth cultures with civilizations long past while both creating and deconstructing our world through arts and the written word. The zine features experimental and innovative prose, poetry, and art all in one unique, eye-catching package. The first prose entry is called Eat Your Words, and is a sort of dictionary word cook-off with two large dictionary companies (Merriam-Webster and Oxford) vying for glory. It is clever and entertaining with words posing as culinary masterpieces. The art accompanying it is glued-in dictionary words surrounding an old mans head. The other prose piece is a longer story titled The Lighthouse Keeper, and it is the story of a man who lives in solitude but finds short-lived comfort in a boy who washes up on his shore. He tries to help recover the boys health, and worries about the day when he may have to speak to another human again. Poetry is most abundant in the zine, and there is one very cool piece titled The Exeter Book Riddles. It is a couple of riddles translated from the original old English, and the answers to the riddles (apparently still debated by scholars) can be found in envelopes glued to the page. Another piece called Its All So Perfect, No Really seems to document a day in the life of a suburban housewife. Her life may seem perfect on the outside, but on the inside she is a mess. A photo series called Breakfast shows indiscernible pictures of food from different locations and theorizes that cooking was the earliest media of creating art and culture because art is more fun when it approaches non-art. There are many brilliant artistic elements including a portrait of the king of rock himself, Elvis. The zine begins and ends with labelled parts of the human anatomy, but the labels are changed to be ironic and humorous. Even the body has become a victim of the hacksaw. With many clever entries, plenty of literary flair, poignant art, and handmade production, this zine is thought provoking and, so far, unaffected by outside forces. The inside of the back cover has some suggested reading and watching materials, with Adbusters magazine as one of their picks. I find it quite contradictory that immediately below this list is a call for advertisers for their zine. For now, the zine is a great place of literary and artistic expression and creativity. I think any advertising would only cheapen it and ruin its cool, independent homemade feel. 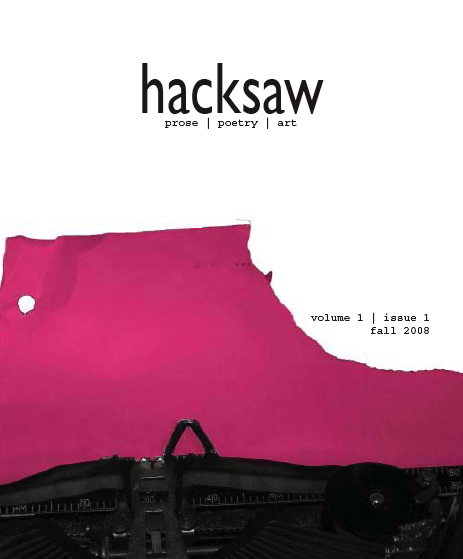 Hacksaw is a masterpiece of literary collage that is distinctive and original; I just hope it stays that way.